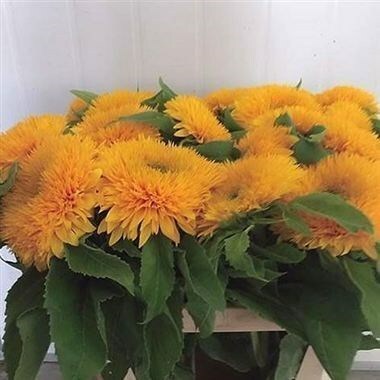 SUNFLOWERS TEDDY BEAR 80cm is a stunning Yellow cut flower also known as 'Helianthus' - wholesaled in Batches of 10 stems. Sunflower foliage is often very scruffy & should be removed before arranging. DO NOT USE FLOWER FOOD WITH SUNFLOWERS - IT WILL KILL THEM. Sunflowers, (real name Helianthus), are a genus of the Asteraceae family and are native to North America. Sunflowers are cultivated in Europe these days for the cut flower market, food and the production of oil.